First things first: Over on the official glog, Sandy Duncan has said that judging of the contest 04 entries has been delayed. YoYo Games estimates that the winners of the popular competition will be announced before the end of January. We appreciate your continued support of GMNews and we want to assure everyone that we have NOT abandoned this website. We understand that some users are concerned about the apparent lack of articles over the holidays and we want to put your concerns at rest. However I feel that in order for you to fully understand what is making it difficult for us to maintain this news blog, I must inform you of the major ‘behind the scenes’ projects that we have been working on over the past year(s) and what Scorptek has planned in store for the near future. Over the past year or so, Scorptek has devoted significant time and effort into researching, planning and building business relationships with other companies so that we can begin to venture out into the world outside of Game Maker News and develop a profitable business model. Some of you may remember some time ago when we conducted a survey of your knowledge, experience and use of Internet and phone services. At the time, many of you were puzzled and were unable to see how the results would be beneficial to us. If you recall, I responded by saying that the simplest explanation is probably the best one. That’s exactly right, the simplest explanation is the best explanation. Drum roll please….. Scorptek will be offering DSL Broadband Internet and Phone services across North America and possibly in other countries in the future. This is exciting for us, and hopefully for you too. We couldn’t have done this without the Game Maker and GMNews community and we appreciate your support. As we get closer to offering our beta program, we of course will be looking closely here and at other Game Maker communities for users who are eager and willing to test our services at largely discounted rates. After the beta program has ended and our service is fully open to the public, registered members of the GMC, YoYo Games or GMNews will in most cases be eligible for discounts or rebates on the services we offer. We are also in contact with a UL listed alarm monitoring company, and we may (if we can negotiate a contract/agreement) also be providing self-install home security systems and 24/7 monitoring services with dispatch. The monitoring services also work with your existing security system (if you have one) and are fully compatible with VoIP and broadband phone lines such as Vonage or our Scorptek service. Finally we may also form a partnership and affiliation with Dish Network Satellite TV resellers to provide you with affordable TV services to accompany your Scorptek Internet, Phone and possibly alarm monitoring services. So as you can see, this is really taking a large chunk of our time and we definitely hope it will be worth while. Please leave feedback on what you think of our business project and any questions you have. If you are interested in becoming a (volunteer) writer for GMNews, feel free to email me personally at pythonpoole /at/ gmail /com/ and include a paragraph about yourself and what Writing/English/English Lit. qualifications you have or a sample of your work. Thanks for being patient, and we hope to serve you in the near future. Please remember to leave comments. Today James Rhodes posted a comment on the YYG GLOG stating that he has constructed a GM game which demonstrates a vunerability in the way InstantPlay handles game launching. It allows the GM executable to silently install a Firefox plugin with no confirmation. This apparently should be an easy fix: the InstantPlay plugin need only change the way it handles the game’s launching. 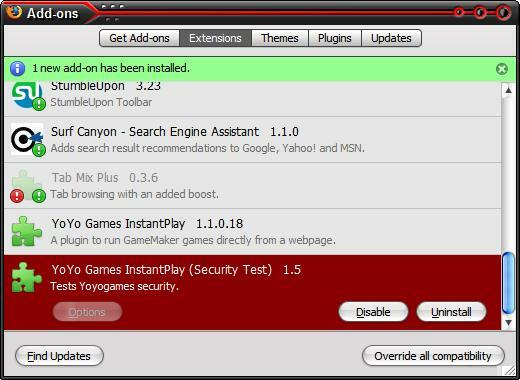 It should be interesting to see how long YoyoGames takes to patch this, considering the seriousness of the vulnerability.